"Speak up for yourself--we want to know what you have to say." From the first moment of her freshman year at Merryweather High, Melinda knows this is a big fat lie, part of the nonsense of high school. She is friendless--an outcast--because she busted an end-of-summer party by calling the cops, so now nobody will talk to her, let alone listen to her. Through her work on an art project, she is finally able to face what really happened that night: She was raped by an upperclassman, a guy who still attends Merryweather and is still a threat to her. 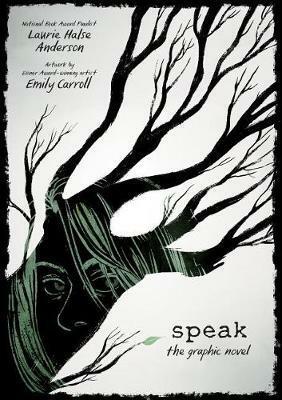 With powerful illustrations by Emily Carroll, Laurie Halse Anderson's Speak: The Graphic Novel comes alive for new audiences and fans of the classic novel. Laurie was the proud recipient of the 2015 Intellectual Freedom Award given by the National Council of Teachers of English, and the 2011 Free Speech Defender Award given by the National Coalition Against Censorship and presented to her by her hero, Judy Blume. She has also received the 2009 Margaret A. Edwards Award given by YALSA division of the American Library Association, the ALAN Award given by the National Council of Teachers of English, the St. Katharine Drexel Award from the Catholic Librarian Association, and the Outstanding Alumni Award, given by the American Association of Community Colleges. She was also nominated for the Astrid Lindgren Memorial Award in 2017, which is one of her proudest accomplishments because it is presented to children's book creators from around the world in honor of the work and life of Sweden's magnificent Astrid Lindgren.